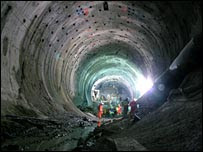 The BBC has a story on our new record setting tunnel at 35 miles. I have driven this region and this will certainly save a lot of time. Fortunately it will only be electricity powered trains passing through, so there won't be choking exhaust fumes like in the current Goddard auto tunnel. Dad would try to hold his breathe through that one. How about getting hit by a flame thrower if you evey time your other left foot gets in the way. That's Dance Dance Immolation and it's not a joke. It's the hottest thing in dance since the Macarena! USA Today reports on the Swiss Army's first invasion. They penetrated Lichtenstein by a mile without being noticed. Sounds like the U.S.-Mexico border, only with soldiers with unloaded guns instead of elephants and a mariachi band.